Rather than the sound of Bow bells, I was born to the whirring of sewing machines in my ear. Throughout most of my childhood, my mother did piecework while my father worked in a sweatshop opposite the beigel shop on Brick Lane, stitching together leather jackets for Mark & Spencer. The factory closed down long ago. Initially my mother’s industrial-grade Brother sewing machine was in the kitchen, in between the sink and the pine wood table. But it took up too much space there and was also considered dangerous, once ambulatory children started populating the house. It was decided that it would be moved to one of the attic rooms on the top floor of our home, following the custom of the Huguenot silk weavers of the past. There the machine lived and there my mother would be found hunched over it, during all hours of the day and often late into the night. She says it was most hard on her back and shoulders, which would ache from the work. I remember the almost-sweet smell of the machine oil, the thick needles, bundles of colourful nylon yarn, piles and piles of skirts in all shades and sizes, the metal bobbin cases and the sound of the sewing machine. When the foot peddle was down, the vibration could be felt throughout the house. Strangely, this provided a sense of comfort – the knowledge that my mother was upstairs and everything in the world was as it should be. When I was around twenty, my brothers and sisters and I colluded with each other to get rid of the sewing machine. It had lain dormant in the attic room ever since my mother gave up taking in piecework some years previously. The work had slowly become more irregular and less financially rewarding. “When I first started, I was able to earn around seventy-five pence per skirt, then towards the end, when there were many more women working, it dropped to around ten pence per coat.” These were also the days when much of the manufacturing in East London was being shipped out to parts of the world where there was cheaper labour, including Bangladesh and Turkey. With my mother’s working paraphernalia left as it was, the space resembled Rodinsky’s room – he was the mythical recluse who once lived a few doors down from us in the attic of 19 Princelet St and who had disappeared one day, leaving everything intact. I had an idea to turn our attic into a study, installing my PC which my mother had bought for me from the money she had saved from sewing. With a separate monitor, keyboard and large hard drive, it was almost as big as her Brother sewing machine. She had always been a hoarder, so we knew that getting rid of it was going to be a delicate and difficult matter. We had given her prior warnings, but these had fallen on deaf ears. Then one night, when she had gone to bed, my siblings and I crept upstairs and, with a lot of effort, detached the head of the sewing machine from the table. Huffing and puffing, we carried it down three flights of stairs and delicately dumped it at the end of our street. We did the same with the table base. Of course, she discovered the machine was missing the next day and was incredibly upset. She had “spent one hundred and forty pounds on it,” she said. “It still worked,” she said, “why had we not told her, she could have given it to someone at least, instead of it being thrown away” and “what had she done to deserve children who were so wasteful.” After that, I forgot all about the Brother sewing machine that once lived in our attic. 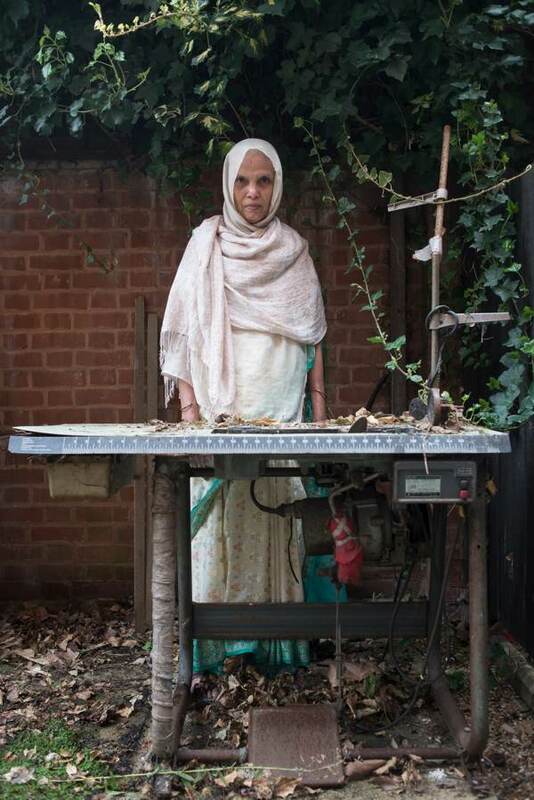 Once when I returned from a trip to Dhaka, researching a book about the people of that city and interviewing garment workers about their lives and fears, I was speaking with my mother when the subject of her earlier life as a machinist came up. And then she announced her revelation. My mother and our Somali neighbour had managed to rescue the sewing machine from where my brothers, sisters and I had thought we had discarded the thing. The two women had somehow managed to shuffle the table base along, scraping hard along the pavement. But instead of bringing it back to the house, they took it to the neighbour’s, where it was to stay in the garden until they decided what to do with it. The machine head on the other hand was far too heavy for them to carry and they abandoned it. This disclosure had to be investigated. My mother and I immediately knocked on our neighbour’s door, and asked if it was still there. 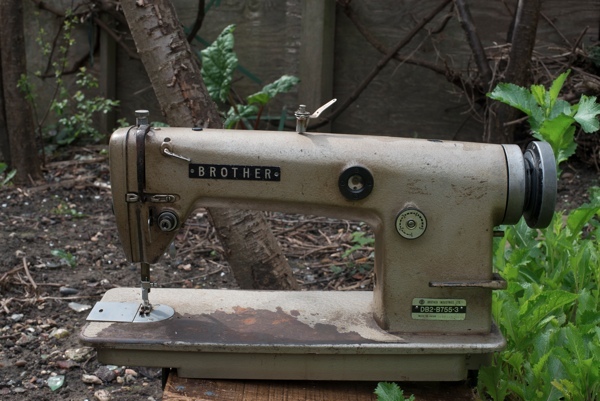 The neighbour led us to the garden where, hidden behind wooden boarding and tendrils of ivy, we found the sewing machine my mother had spent so many years working on. Considering it had endured years outdoors, it looked like it was still in relatively good health. Bits of it, such as the bobbin winder and the spool base were slightly rusty, but the address of the showroom on Cambridge Heath Rd where my mother bought it was clearly labelled and the motor looked in working condition. She is still upset with my brothers and sisters and me for throwing it away. This confused me. “Why would you want to hold onto something that is a source of oppression?” I asked, high-mindedly. 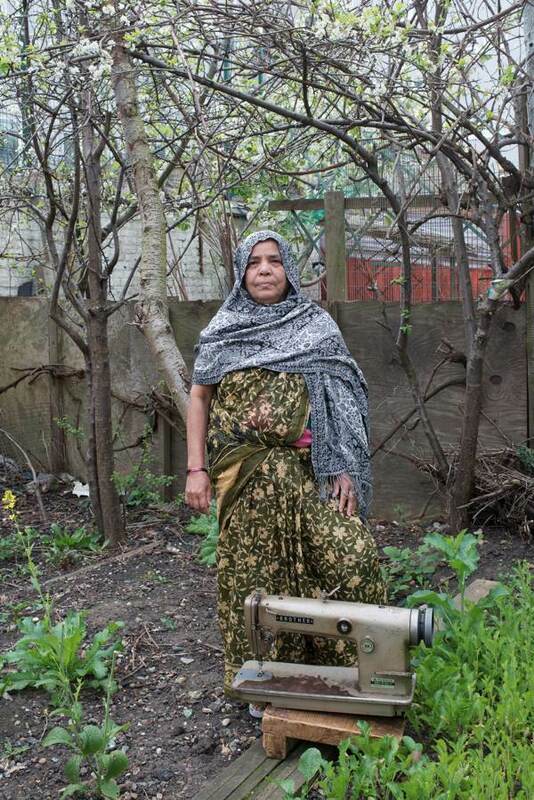 “The machine helped to feed and educate my family,” she answered quietly. 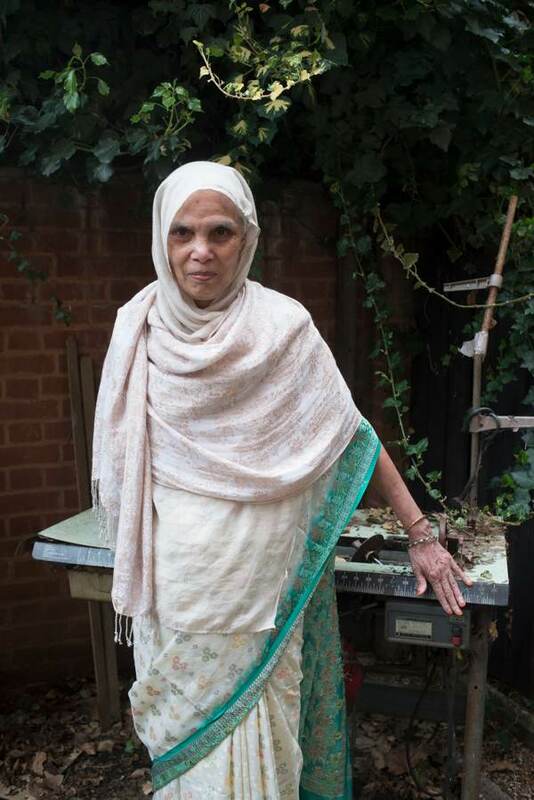 My mother then reminded me that my aunt, her sister, also had a Brother sewing machine and made skirts for many years from her kitchen in Bethnal Green. We went to speak to her. She no longer works as a seamstress and has resorted to keeping her dismembered machine on the veranda of her ground floor flat. The table now stores pots and pans, baskets containing seeds and drying leaves. The head was in the bottom drawer of a metal cabinet next to it, wrapped up in a Sainsbury’s shopping bag. My aunt still has some of the cloth which she would make into skirts and she showed me the pleats on a piece of salmon-coloured material. While I took notes, sitting on the chair she would sit on whilst working, I could hear dregs of conversation between the two sisters, comparing the quality of oranges in Bethnal Green market to Asda and Iceland, as well as recalling what happened to other women whom they both knew that had worked as seamstresses. This industry, now gone, is a piece of the thread that joins the past with the present in the East End and, in turn, unites the people who have come to make this part of London their home. Wonderful story, but I agree with Arful Nessa, the sewing machine should not have been thrown out. After all, it was her sewing-machine, not her children’s. Oh, how I sympathise with the lady who has had her sewing machine taken away. I have three machines and each is precious. They each have different uses and each triumphs over the others in the quality of the work it produces. One makes perfect buttonholes, another can make heavy duty repairs to horse rugs, another does computerised embroidery and sew the finest of fabrics. My machines have been part of my children’s and grandchildren’s lives. The clothing and gifts they have made hold such happy memories for me. Such a touching story, thank you. My nan also did ‘outdoor work’ on her Singer. I spent a lot of time with her and totally relate to how the whirring of the machine meant all was right with the world. I have lovely memories of going with her to buy off cuts of material at Bethnal Green Rd market. and having them transformed into something wonderful by the end of the day!